An admitted Pinterest addict, LeAnn loves a good themed-event challenge. Somewhat of a social butterfly, she's got the connections and attention to detail to truly make your event memorable. 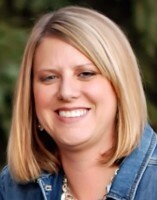 LeAnn is a proud to call Fargo home, where she lives with her husband and son. Kristi has a natural talent for bringing fun to any situation. Kristi strives to ensure smiles are at the forefront of your event. Interested in event planning? We're regularly looking for part-time helpers. Internships are also considered. Drop us a line via our Contact page and let's talk!